Published: Feb. 23, 2013 at 02:52 p.m. Updated: Feb. 23, 2013 at 06:52 p.m.
INDIANAPOLIS -- I feel for Manti Te'o. The Notre Dame linebacker stood up under the hot lights and told his story. He answered every question from every last curious writer, emphasizing that he wants to move forward. He should be allowed to. Te'o, once considered the best inside linebacker prospect in the nation, told reporters gathered here at the NFL Scouting Combine on Saturday: "I learned the difference between the things I can control and can't control," and, "I'd really like to talk about football." Te'o's presser jam-packed the media center inside Lucas Oil Stadium. His nerves were evident out of the gate, but he kept his calm as the media buzzards circled. There was a gross feel to the affair. "This is pretty crazy," Te'o said. "I've been in front of a few cameras, but not as many as this." Invariably Te'o was quizzed about the fallout of his bizarre relationship with Lennay Kekua, the phantom girlfriend created by an acquaintance, Ronaiah Tuiasosopo. Te'o maintains he was not involved in the online hoax, but he admits to lying about it after it was discovered. That's something Te'o said every NFL team has asked him about at the combine. 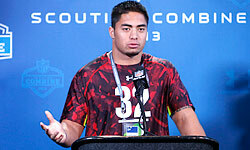 "They want to be able to trust their player," Te'o said. "You don't want to invest in somebody who you can't trust. With everybody here, they're just trying to get know you as a person and as a football player. I understand where they're coming from. It could be a hurdle or it could also be a great opportunity to show who you really are. And that's the way I've approached it." New York Giants general manager Jerry Reese told a group of reporters earlier Saturday that the Te'o narrative has been overblown. Every year, prospects hit the NFL draped in colorful baggage. Whispers of drug and alcohol abuse, assault, broken homes and character flaws galore -- nothing is new. Dial it back a month, and Te'o's toughest questions centered around his barren performance against Alabama in the BCS national title game. But anything related to football was a welcome query as the youngster tried to explain his complex personal life to NFL scribes. He did fine. Besides, Te'o's face-to-face interviews with league coaches and front-office men bear far more weight than the media crush he faced Saturday. Te'o's no public enemy. He's yet another imperfect young man, and scouts -- ultimately -- want to find out if he's the right person to bring onto a professional football team. He won't be the only NFL player with some growing up to do.